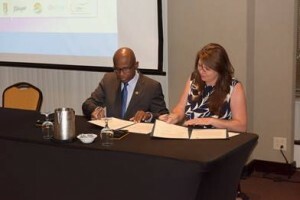 NEW YORK - The Caribbean Tourism Organization (CTO) has signed a Memorandum of Understanding (MOU) with the Travel Foundation (TF) to formally establish a framework of cooperation and facilitate collaboration between the organizations in areas of common interest to contribute to sustainable tourism development in the Caribbean Region. The MOU was signed by CTO secretary general Hugh Riley and Salli Felton, TF chief executive officer on Thursday, June 8, during a CTO press conference held during Caribbean Week New York. TF, the international charity that works with destinations and leading organizations to improve the impacts of tourism on people and the environment, and CTO will facilitate the joint implementation of projects and publications, the organization of workshops, seminars, meetings, conferences, and other initiatives on matters of common interest. The two organizations will support and participate in each other’s relevant projects and activities. “To further our ongoing work in the Caribbean, we are pleased to partner with CTO to facilitate future tourism development which promotes thriving communities and a healthy environment,” added Ms. Felton. This agreement follows the recent announcement of CTO and TF’s launch of a free online sustainable tourism course for ministries, government departments, tourism authorities and tourist boards engaged in destination management in CTO member countries. The course is designed to help increase knowledge of how to review and plan for the sustainable development of Caribbean tourist destinations. Benchmarked with good practice case studies, the course will sharpen participants’ ability to plan the development of their local tourism industry in a way that meets the needs of both visitors and host communities, creates a more resilient economy, protects tourism assets and secures the future tourism potential of Caribbean destinations. To register for the free online course, please click on the following link: travelfoundationtraining.com/caribbean.